The Aluminum Portable Laptop Stand offers a solution that is practical, portable, and affordable. 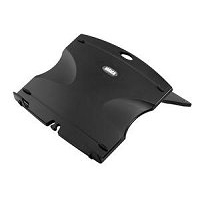 Constructed of rigid aluminum, it provides sturdy, stable and durable support for your laptop, easily folding flat for storage and travel. The aluminum construction also better facilitates heat dissipation than similar stands constructed of other less heat conductive materials. 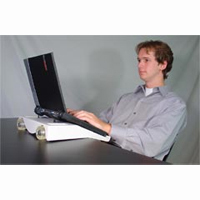 The Aluminum Portable Laptop Stand offers six angle settings (20°, 22.5°, 25°, 35°, 40°, & 45°) which offer improved viewing and greater screen elevation which can assist in reducing neck bending. 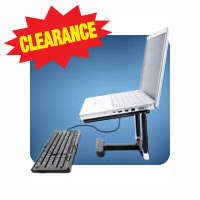 In addition, a convenient built-in swivel base means the laptop can easily be swivelled for viewing by multiple individuals. A neoprene storage sleeve is included to protect both the laptop stand and laptop from damage. The sleeve also doubles as a mousepad for an external mouse. The LHA-3U model includes a 4-port USB 2.0 hub for easy connection of peripheral devices. The hub is equipped for connection of an AC Adapter (not included) if a powered hub is desired. The iFold raises your laptop to monitor height, giving you desktop computer comfort, without sacrificing the mobile convenience of a laptop. 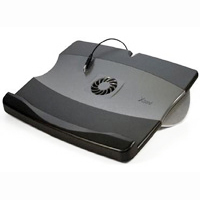 Simply plug in the included Folding Keyboard and add a separate mouse to alleviate neck and wrist pain. 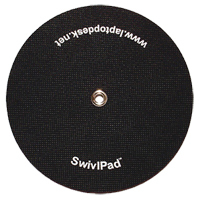 Rubber pads hold your computer safely in place, while air passes freely underneath, keeping your laptop and your lap cool. When folded flat, the iFold makes a great cooling pad. 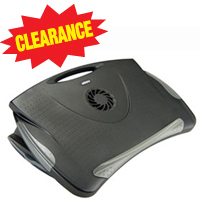 If your notebook runs too hot to use on your lap, simply slide the iFold under it. Folds flat to fit in laptop bag. Leaves all ports and slots on your computer accessible. "Open air" design allows air circulation so laptop runs cooler and more quietly. Constructed of highest grade acrylic, embedded with chromed zinc alloy hinges. Note: iFold (IF102) and Folding Keyboard (FK205) are bundled. Only the keyboard is available separately. Slip your notebook into the SmartFit stand, plug in a single USB 2.0 cable, and you're ready to enjoy the ergonomics and productivity of a desktop. The built-in copyholder positions documents in line with the screen for easier viewing, while the screen itself can be height adjusted for optimal viewing comfort. There are five spaced USB 2.0 ports which allow you to connect multiple USB devices such as printer, external hard drive, or iPod, and the 10/100 Ethernet port maintains your Internet connection, avoiding wireless hangups or hassles. In addition, the USB ports are always-on, even when your notebook is turned off or disconnected, so that you can still charge your iPod or Smartphone overnight. 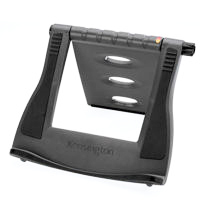 This easel type notebook riser improves the viewing angle of a laptop monitor. It also increases airflow around the notebook, reducing strain on the battery and circuitry. Five height adjustments: 3°, 6°, 25°, 32.5°, 40°. 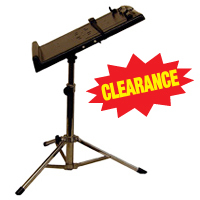 Non-slip pads on base and easel ensures notebook is held securely in place. Fits notebooks 12" to 17". Screw-type friction knob locks angle. 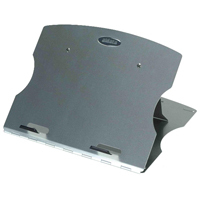 1" (2.5 cm) ledge, contoured to allow easy access to centre front drives. Cable management openings on easel. NOTE: Laptop computers should always be used with an external keyboard and mouse. 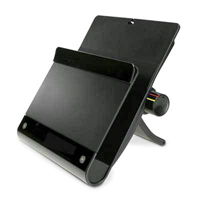 The Aidata Laptop Stand/Adjustable Phone Stand easily adjusts to elevate your phone 15°, 25° or 35°. It features a non-skid surface, and a lip at the bottom ensures the phone won't slide off.